Sustain Design Studio‘s newest prefab home, the 12×36 TRIO, recently landed in Brighton, Ontario. With its butterfly roof and passive solar design, the California Edition of the Trio is energy-efficient, has a small environmental footprint, and it is available at an affordable price. The TRIO brings a lot for its small size of 436 sq feet. Inside you get 10 foot ceilings, a master bedroom, kitchen, living space and bathroom. This 12×36 California Edition starts at $134,900, and it can be expanded with other modules up to 1,100 sq feet. Designed for passive ventilation and cooling with operable windows on the east and west as well as southern facing windows to help bring in heat, this little home has energy efficiency at heart. The home also includes a tankless hot water system, energy efficient lighting and an integrated HVAC system to reduce the energy load where possible. FSC-certified woods and formaldehyde-free finishings make for a green and non-toxic interior. Additionally, the home is wired for easy installation of a wind or solar system, which could make it off-grid capable. Sustain Design Studio debuted the design for the new miniHome last year at Dwell on Design in LA, and we’re thrilled to see the finished project. The Canadian-based firm is also responsible for the SOLO miniHome prefab, which unfortunately is no longer in production. It's not very meaningful to compare the per square foot cost of a 2700sf house (Flueckiger's) and a 436 sf prefab one. Smaller houses will generally have higher sf costs as the expensive components - skin, appliances, fixtures - are in much higher proportions to the total area. The cheapest sf are the big areas in the middle of the rooms. Economies of scale are just that. Flueckier's house is wonderful, but when you compare cost per occupant, the comparable cost is less unbalanced. Of course you can find examples of houses that are cheaper, and just because the word "affordable" is in the title doesn't mean this house intends to replace all forms of affordable housing. It's fulfills a very specific niche, and compared to others of this type, quality, energy performance, yes, it is affordable. If you want to find out how to build an affordable house, look up Upe Flueckiger (my architecture studio professor). He built a home for less than $55 per square foot. These people are completely out of touch with reality. Who decided what is affordable on this blog? Unfortunately, again this is ridiculous as I have a 1,500 square foot house that cost 20,000 less than this, and a normal trailer this size would probably cost less the $50,000. Passive solar and a butterfly roof don't cost a lot - let's see how cheap we can make sustainable so average people can go green. $309 a square foot is not affordable. 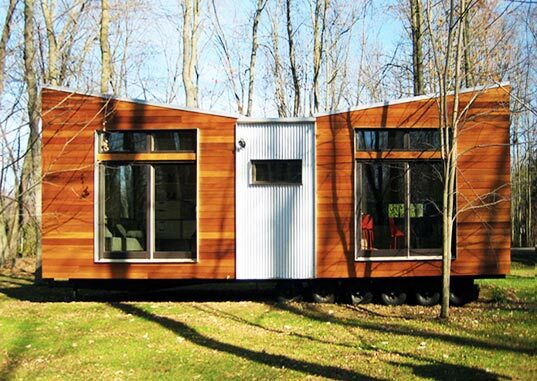 Sustain Design Studio's newest prefab home, the 12x36 TRIO, recently landed in Brighton, Ontario. With its butterfly roof and passive solar design, the California Edition of the Trio is energy-efficient, has a small environmental footprint, and it is available at an affordable price.